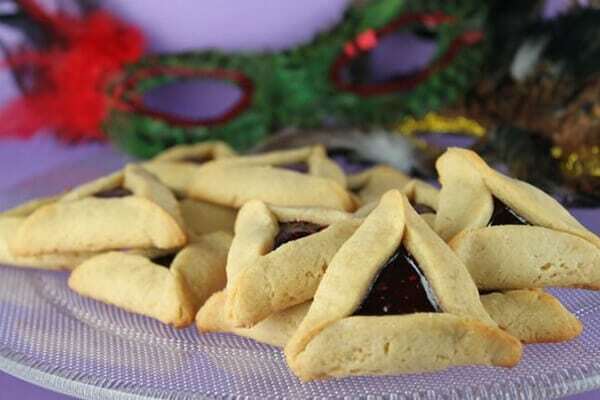 Celebrate Purim with this easy recipe for Hamantaschen Cookies. This buttery version of Hamantaschen incorporates matcha green tea into the dough and is filled with a white chocolate ganache. If you’re looking for the classic flavor, simply leave out the matcha and fill with prune or poppy seed jam! I first made Hamantaschen cookies years ago when I was heading up to Santa Barbara and Solvang for a weekend of wine tasting and wanted to surprise my then boyfriend on the way with his favorite cookies. To make the Hamantaschen, I started with Tori Avey’s buttery cookie dough recipe and filled it with the New York Times’ prune jam. The latter of which tastes way better than it sounds. Because, honestly, prune jam sounds pretty miserable. The Hamantaschen cookies didn’t last long and got rave reviews, but I haven’t made a batch since. But, with Purim coming up in a week, I thought it might be about time to do so! This new recipe plays on the original, but I added matcha and filled them with white chocolate filling to make matcha hamantaschen cookies! 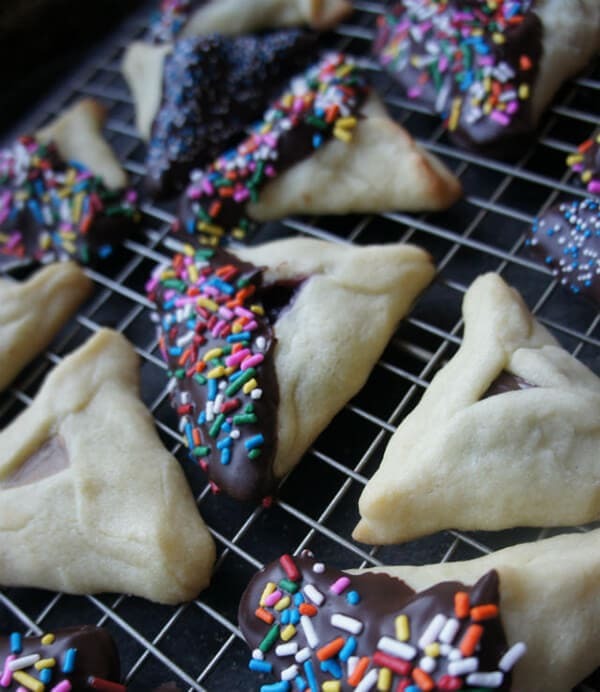 Hamantaschen cookies (pronouced huh-min-tah-shun) are triangular cookies baked to celebrate Purim. They’re said to represent the hat the villain Haman wore, though they have also been known to represent his pockets or even his ears. Traditionally, Hamantaschen are filled with prune or poppy jam, but you really can fill them with any jam you like. I will say, if you make the prune jam, the recipe makes an insane amount of filling. I had about two pounds of filling in the fridge leftover in the fridge. But, it was very easy to make. I simply combined prunes, lemon juice, sugar, and water, cooked it down, then let it sit and firm up. You also need to let the filling set for at least eight hours before you use it in the cookies. I had a lot of fun building the cookies and I’ve included step-by-step directions below (here’s a great step-by-step illustration by Aly Miller that’s helpful). After your dough has chilled in the fridge for at least an hour, roll the dough out on a flat, floured surface until it is approximately 1/4″ thick. A little thinner is ok, but any thicker makes them hard to fold. Brush each cut circle with the egg wash. Then, place up to one teaspoon of filling in the center. Do not use more filling unless you want them to overflow in your oven. No one wants that. So, no overfill-y! 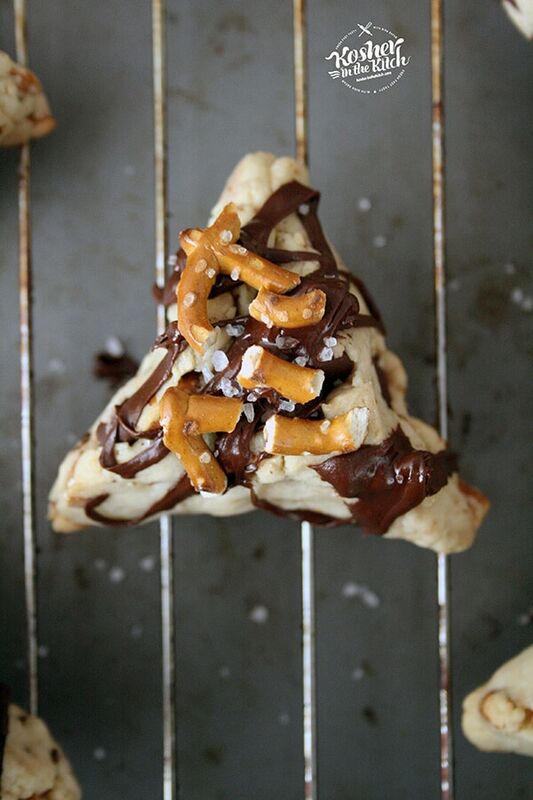 And, even if you do fill the Hamantaschen with one teaspoon or filling, you may still have a few that volcano. I found the white chocolate filling overflowed a little using one teaspoon, so I would use a little less. I suggest using 1/2 teaspoon in the recipe, but 3/4 would probably work. This is the most complicated part of the whole process, but it’s not hard. 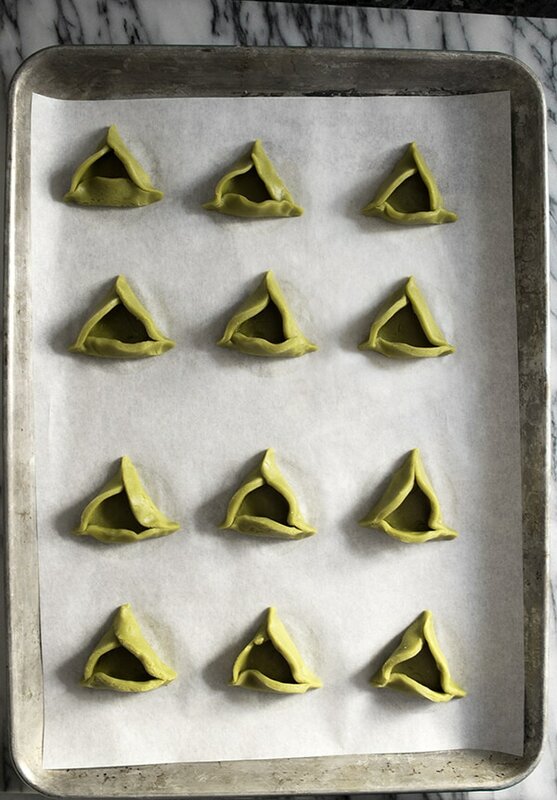 To fold Hamantaschen, pick up the left side and fold it 1/3 of the way towards the center. Pick up the right side and fold it 1/3 of the way towards the center. The top should overlap the left side to create a point. Fold the bottom 1/3 of the way towards the center. Tuck the left side of the bottom fold under the left fold. The right side of the bottom fold should overlap the right fold. Pinch each corner gently to help contain the filling as it bakes. Brush all corners with egg wash. When folding, you may find the dough cracks or breaks on the thinner ones. These are likely to open when baking, but they’ll still be tasty. Transfer the prepared Hamantaschen to the fridge and let them chill for 30 minutes before baking. I find this helps them stick together when they bake instead of collapsing into a plate of sad-looking Hamantaschen. I tested it both ways (with chilling and without) and the chilled cookies definitely held their shape better. Bake for 10-12 minutes at 350°F until the edges are light golden brown and let cool completely before enjoying. Otherwise, you’re gonna be in a hot jam! Get it? Hot jam? I blame Hannah for this. 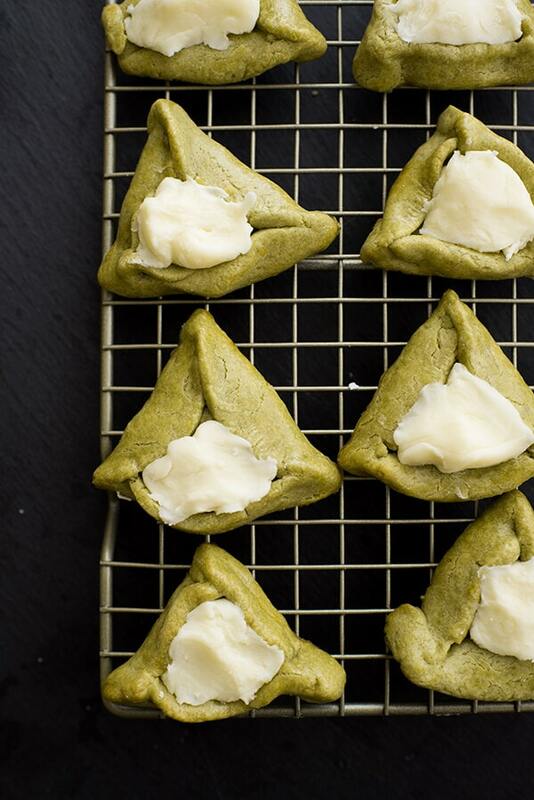 This matcha Hamantaschen cookie recipe filled with white chocolate is perfect for celebrating Purim! Leave out the matcha for the classic flavor. 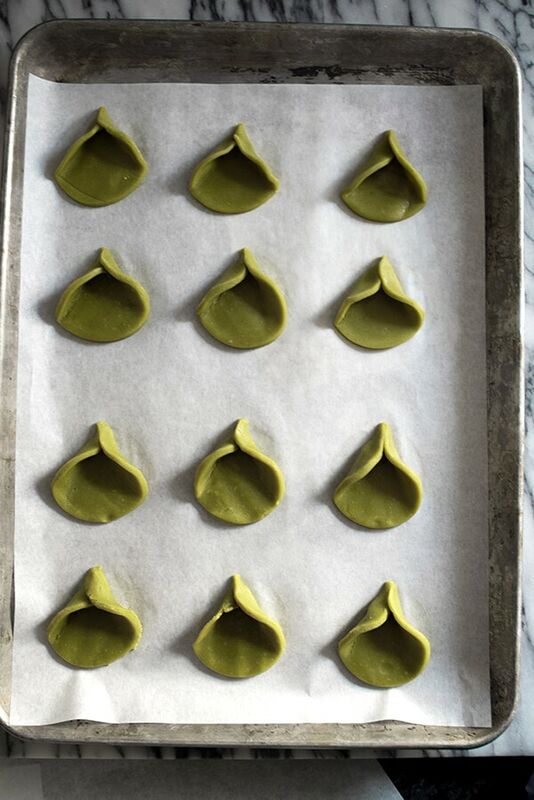 Combine flour, matcha powder, and salt in small bowl. Set aside. Cream the butter and sugar on medium-high speed until light and fluffy, approximately 3 minutes. Add egg and vanilla extract to butter mixture. Add flour mixture to butter mixture, mix until combined. Remove the dough from the mixer and form it into a smooth ball. If the dough is crumbly, add one teaspoon of water at a time. If the dough gets too wet, add one teaspoon of flour at a time. Press the dough into a round disc, wrap in plastic, and refrigerate for at least an hour. Roll out the dough between two pieces of parchment paper until it is 1/4" thick. Cut out circles using a large round cookie cutter. Transfer to parchment-lined baking sheet. Brush each circle with egg wash. Place 1/2 teaspoon of white chocolate filling in center of each. Fold the left side 1/3 of the way into center. Repeat with the right side. The top of the right fold will overlap the top of the left fold. Repeat with the bottom. Tuck the left side of the bottom fold under the bottom of the left fold. Pinch all corners. Brush corners with egg wash. Transfer to refrigerator and let rest for 30 minutes. Bake Hamantaschen cookies for 10-12 minutes or until they are light golden brown. Let cool completely. Place white chocolate chips and heavy cream in small saucepan and turn heat to low. Cook, stirring continually, until no chocolate chips remain. Remove from heat and transfer to medium bowl. Add confectioner's sugar and stir until completely combined. If you're not a fan of matcha, simply leave it out of the recipe. You may find you'll need to add 1 or 2 teaspoons of water to create a smooth consistency before chilling the dough. Bored with prune and poppy filling? Try these! 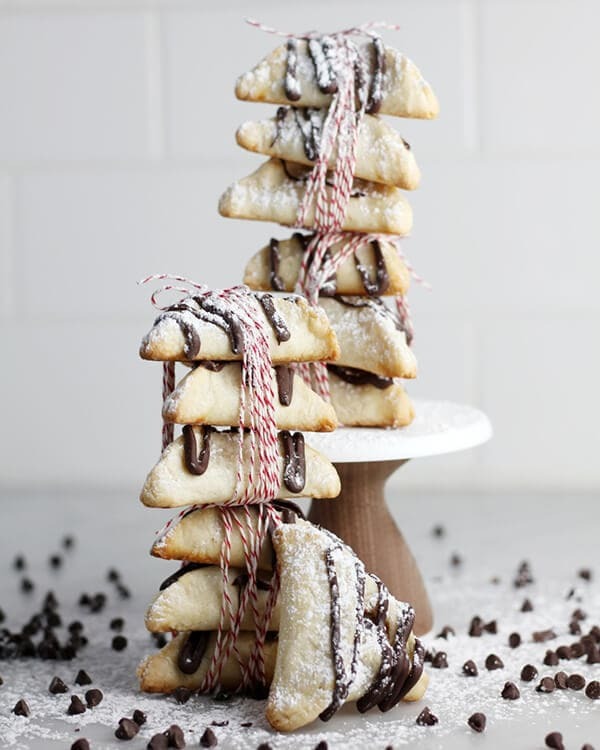 Italian-inspired Cannoli Hamantaschen filled with creamy ricotta cheese and topped with a drizzle of chocolate and confectioner’s sugar. 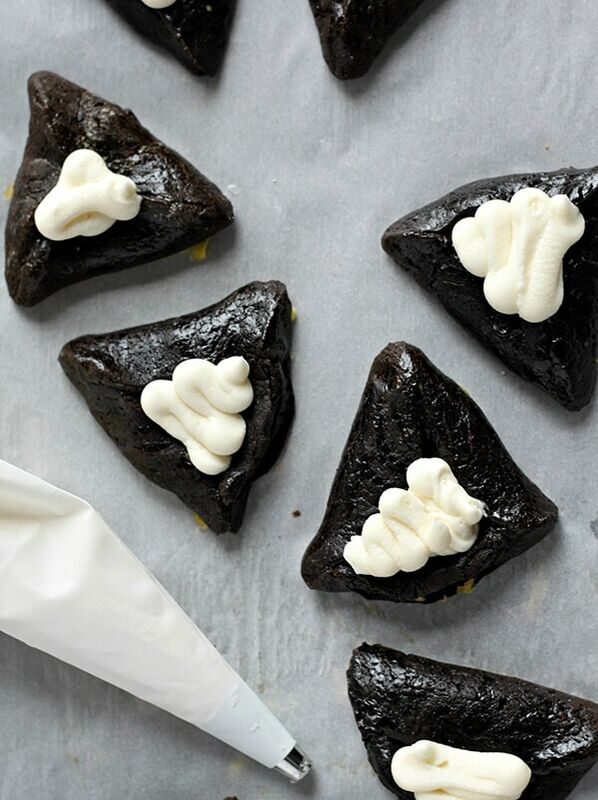 Chocolate pastry and classic Oreo-inspired filling? Yes yes yes. 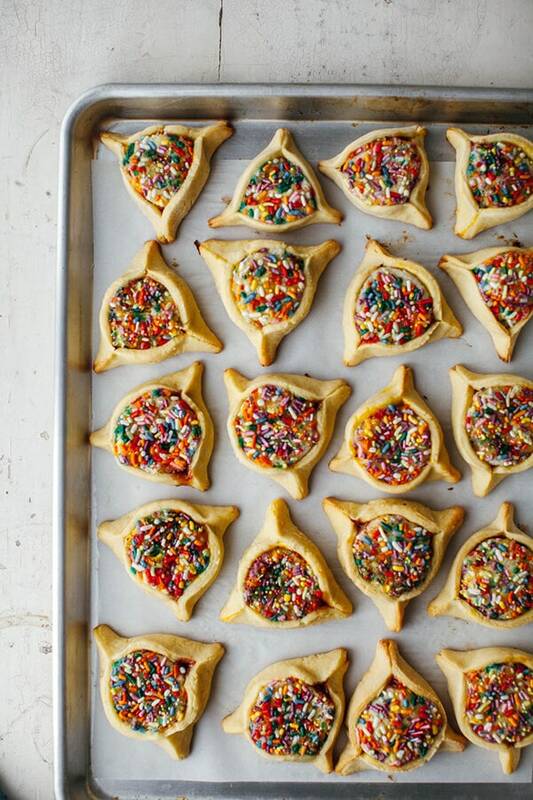 These cookies by Molly Yeh take the sprinkle game to a whole new level. 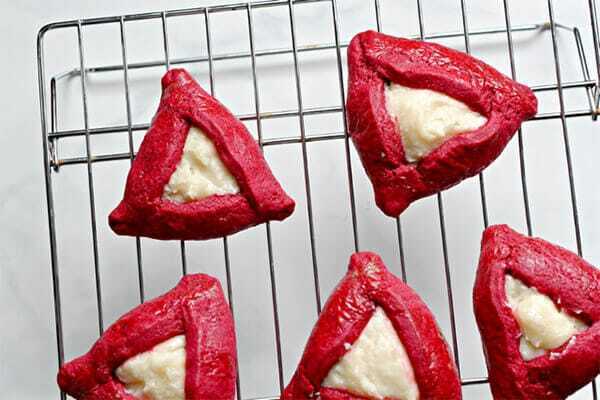 I’m a big fan of red velvet (evidence: Red Velvet Donuts and Red Velvet Cupcake recipes) and was thrilled to find this Red Velvet version of the classic triangle cookies. Almost everyone loves cookie dough and this recipe uses it to fill the chocolate cookies! This dairy-free dough recipe is filled with chocolate and topped with pretzels and pinch of seal salt. Use cacao to keep it dairy-free. 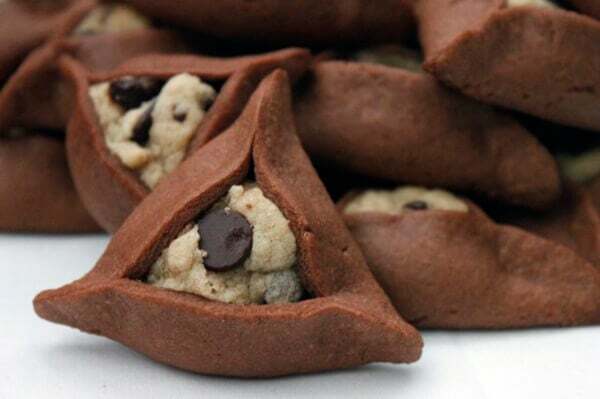 The Nosher has a ton of Hamantaschen cookie recipes on their site and this is another of my favorites (the Cannoli version above is theirs as well). Once you fill the cookies with the jam of your choice, simply dip them in chocolate and add sprinkles for a festive touch. I’ve never had these, but they sound delicious! I love that you changed them up with some matcha! Thank you! 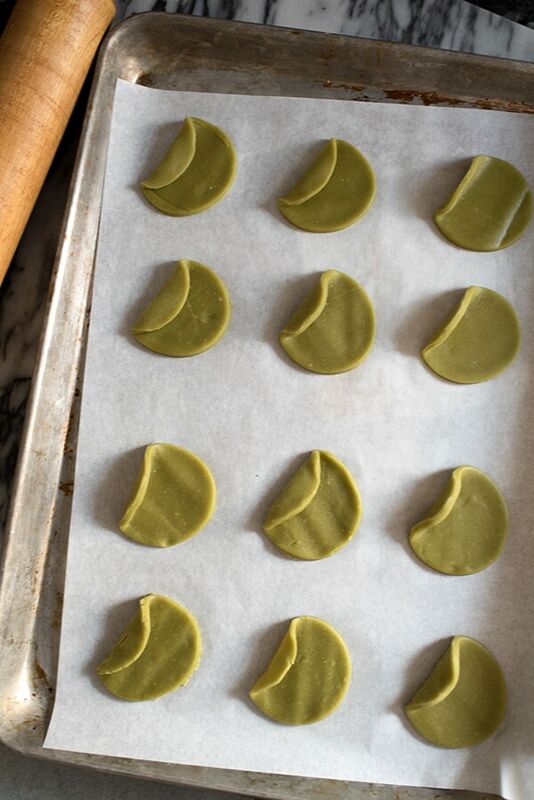 I’m such a fan of matcha and thought they could be tasty as hamantaschen cookies! But the same dough could be used to make standard cut out cookies with the white chocolate filling! I love incorporating green tea into baked goodies! This looks and sounds fabulous. 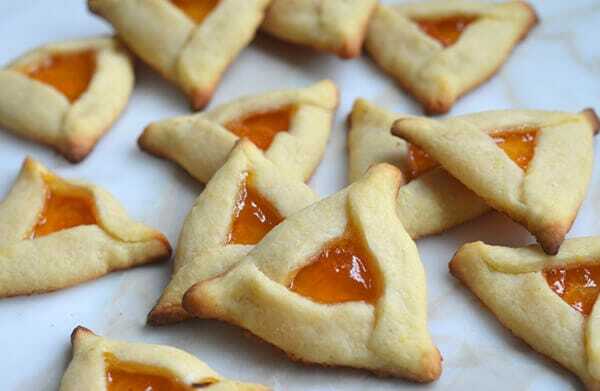 I’ve never made Hamantaschen Cookies but I think I need to get on it! Such a great colour from the matcha! And it sounds great with that white chocolate ganache. Lovely! I love hamantaschen cookies and Purim in general is my favorite holiday of the year 🙂 Your hamantaschen look amazing and so delicious! 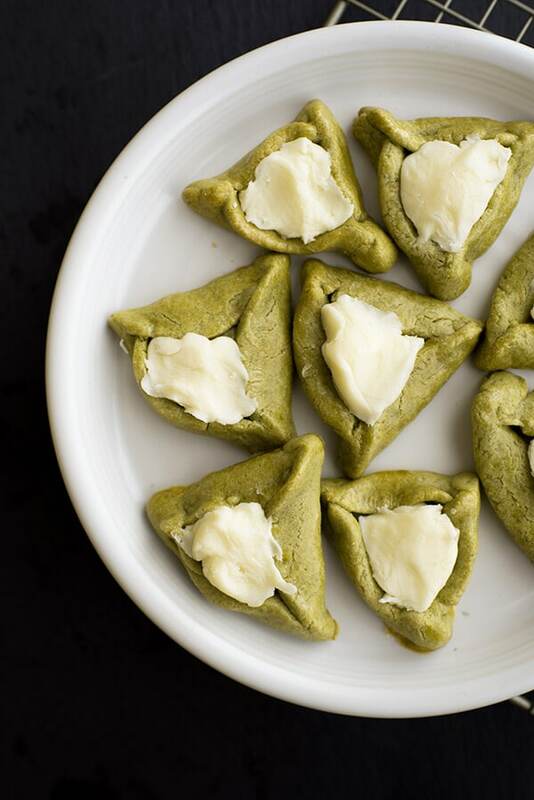 I never thought of using matcha in hamantaschen – sounds so good and unique! Thank you, Natalie! Purim is such a fun holiday! 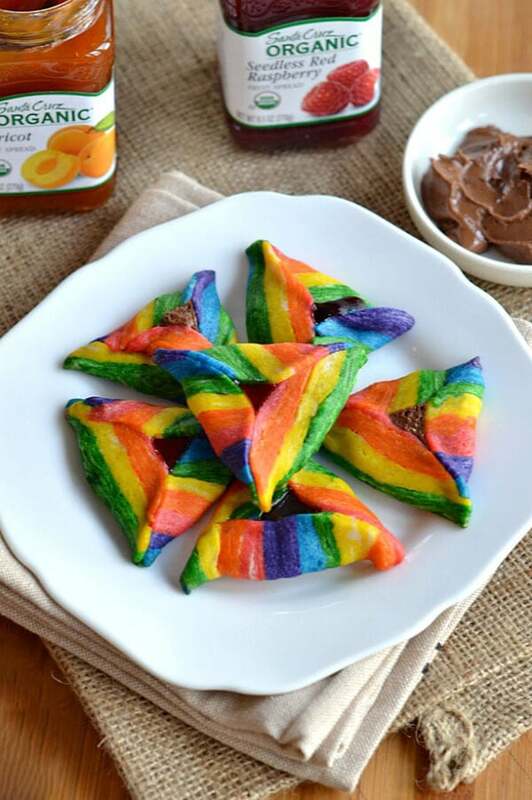 What flavor hamantaschen did you make this year? I love matcha and I love hamentaschen cookies. You have such an awesome collection. I’ve spend my week making a variety of these cookies. You have such a wonderful collection. Veena! Thank you. Do you have any tips to help them from spreading? I’m doing one more test this morning and baking the filling into them. They’re still yummy as iced flat cookies, but I’d prefer if I can get the whole batch to hold their shape!